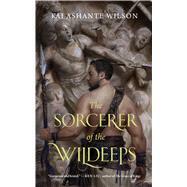 Kai Ashante Wilson's stories "Super Bass" and "The Devil in America," the latter of which was nominated for the Nebula, the Shirley Jackson, and the World Fantasy Award, can be read online gratis at Tor.com. His story «Légendaire.» can be read in the anthology Stories for Chip, which celebrates the legacy of science fiction grandmaster Samuel Delany. Kai Ashante Wilson lives in New York City.